AVENTURA, FL--(Marketwired - Jul 28, 2015) - Vacationing in Miami may feel like its own reward, but the Courtyard Miami Aventura Mall has ways of making even the best feel extraordinary. Case in point is its bevy of North Miami vacation packages. With special offers for romance, dining and everything else under the sun, this property makes a Miami escape one worth repeating. For many, getting away is best shared with a significant other. That's why this Aventura hotel lets travelers choose between the Couples Getaway and, for LGBT guests, the Pride & Joy package (both starting from $185 per night) including free Wi-Fi, late checkout, breakfast for two at The Bistro each morning, and a bottle of Champagne upon arrival. The Couples Getaway also includes a fruit-and-cheese platter, while the Pride & Joy offer features two AMC movie tickets per room. Those looking to indulge their palates, meanwhile, will appreciate the Wine and Dine experience. Starting from $199 per night, this package invites guests to savor the fresh, seasonally-inspired fare of The Bistro with breakfast and dinner for two each day. The offer also includes two cocktails -- from margaritas to bloody marys -- each evening. 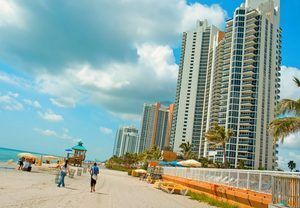 Other popular package options include the Stay for Breakfast offer (starting from $179), with its daily complimentary breakfast for two adults and two children; and the Aventura Mall Shopping Spree (starting from $189), which spurs guests on to shop till they drop, thanks to a $50 gift certificate to the Aventura Mall, an Aventura Mall voucher for a Rewards Discount Card, breakfast for two and late checkout. Those holding a valid ID from Latin America or the Caribbean can enjoy their own Latin American Shopping Package during a two-night (or longer) stay. Starting from $169 per night, this offer includes breakfast for two and a $50 Aventura Mall gift card. Guests on their way to or from a cruise can also get in on the fun with the Pre- or Post-Cruise Package. Offering a one-way transfer to or from the port, and with rates starting from $209, the deal includes daily breakfast for two, late checkout and 10 nights complimentary parking while guests are cruising. Another practical option is the Park & Stay deal (starting from $169), which includes parking for travelers staying at the hotel. All packages include complimentary on-site parking for the duration of one's stay, free Internet and deluxe accommodations. The recently updated hotel rooms and suites, which feature plush bedding, ergonomic workspaces and flat-screen televisions, are some of the most comfortable in Aventura. And, best of all, all the packages are available throughout the year. So that unforgettable summer vacation can be repeated in the fall, winter and spring. With newly renovated interiors, tech-friendly features and award-winning service, the Courtyard Miami Aventura Mall matches the city's cosmopolitan feel. Guests will enjoy 166 guest rooms and suites outfitted with deluxe bedding, free high-speed Wi-Fi, ergonomic workspaces and coffee service. Two meeting rooms facilitate successful gatherings with state-of-the-art technology; and The Bistro serves fresh and healthy fare all day long. Courtyard Miami Aventura Mall provides North Miami travelers a variety of hotel deals to help make their ideal Miami getaway perfect.